For a limited time, Enigma are offering PHOs / PHNs and a select number of their clinics, a free, two month trial of PREDICT CVD-Diabetes. This offer is available to Public Health Organisations who have yet to adopt a formal CVD Risk Assessment, Communication and Management tool for use within their practices. Predict’s, CVD-Diabetes module is a leading, acclaimed, clinical decision support tool aimed for use at the time and point of care, with Patients. It generates personalised, Guidelines based information to aid enagement between the clinician and Patient. Personalised risk communication, and management plans are generated for patients at any risk level, from those at very low through to those who have already had an event and need intensive follow-up and management. 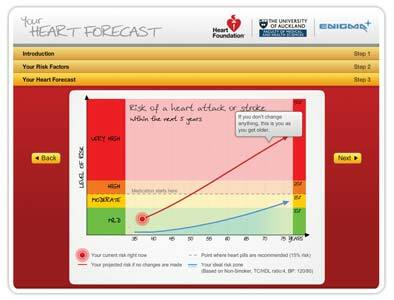 Licenses to use Predict include direct access to Your Heart Forecast, another wonderful tool, created by the people at Enigma. Predict CVD-Diabetes also integrates directly with the Roche, cobas b 101 device, delivering point of care test results for Lipids and HbA1c direclty into the management templates. If you’re interested in talking to Enigma about a free trial, please contact us to discuss options.